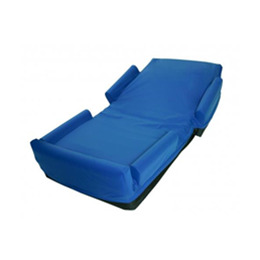 The unique built-in bolsters help promote a safe sleeping environment without compromising the patient’s sleeping area. If you're afraid of questionable aftermarket add-ons, choose SelectProtect. It is specifically designed to fit standard SelectAir and SelectAir Max low air loss systems. It replaces the standard cover and easily zips around the SelectAir mattress. Simply order SelectProtect as an option with new systems or as an upgrade to systems that are already in use. • are at risk of falling out of bed. • reside in facilities where bed side rails are not used. • currently use standard SelectAir or SelectAir Max low air loss mattress systems and need a safe sleeping environment. Size: For use with standard SelectAir and SelectAir Max low air loss mattress systems only. Custom sizes are not available. Weight Limit: SelectProtect is intended for patients that weigh 75 to 400 lbs. which is the same weight limit for standard SelectAir andSelectAir Max low air loss mattress replacement systems. * Use of SelectProtect should be determined based upon facility protocols, applicable laws, regulations, guidelines and individual user safety considerations. It does not replace the need for patient fall prevention measures.